Water emergencies like floods and pipe bursts can spell trouble for the homeowners of Godfrey, so whenever you’re in need of expert water damage repair and restoration, turn to 911 Restoration Metro East for assistance. Our water damage Godfrey team is trained and equipped with advanced equipment that will allow us to make your home look good as new! Roof leaks, pipe bursts, and toilet overflows are major concerns that need to be dealt with right away to prevent any further damage to your home such as drywall flooding and wood rot. Whenever you need these situations handled immediately, the water damage Godfrey experts can be there right away with our lighting fast 45-minute response time. Our quick response will not only prevent more harm to your home, it will also help give your home a fresh start as soon as possible! Once our experts arrive, we will conduct a free visual inspection of your home to identify the problem and to determine the best course of action. We will also offer an estimate at affordable prices. Our specialists are available 24/7 so day or night, you can get the on the day service you need to make your home a safe and comfortable place for you and your family. Allow 911 Restoration to give you a fresh start! There are several ways that water can intrude into your home. One way it can is through a hole in the roof. Roof leaks are among the most common water headaches for homeowners. 911 Restoration’s water damage Godfrey team has the training and over three decades worth of experience to deal with these kinds of problems and we can patch those leaks up with relative ease. Aside from resolving the problem for you, our experienced team can also offer you a few tips that can help you prevent these situations and keep your home protected from water damage in the long run. Keep a regular schedule for cleaning gutters. Clogged gutters are one of the reasons water can seep into the roof and into your home. Make sure clean your gutters on a regular basis to remove leaves and debris. This will allow rainwater to properly redirected away from your roof and foundation. Inspect the roof on a regular basis. At least twice a year (in spring and fall), check your roof for any signs of damage like missing or curling shingles. Being able to repair these issues early on can help you prevent water from seeping into your home. Check your attic’s insulation. Excess attic humidity could be an indicator of roof damage. That moisture could also lead to mold growth. Allow professionals to come and help you with this situation. 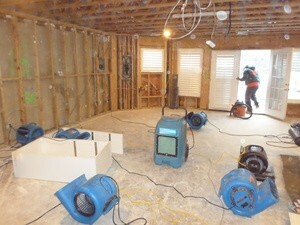 911 Restoration makes use of advanced drying technology to be able to extract water and remove moisture from your home. 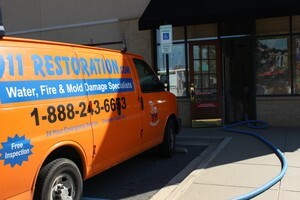 Once the water is removed, our team will make sure that roof damage is repaired and the ceiling stains are removed. Our IICRC certified technicians have undergone rigorous training to be able to provide you with the highest quality of water damage repair and restoration. If you’re looking for a fresh start after a water disaster strikes at home, call 911 Restoration Metro East today!